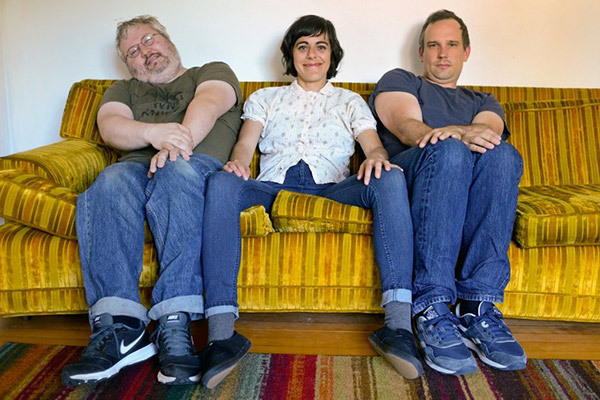 Emerald City trio Wimps, which celebrates the release of its second album “Suitcase” on Friday (Nov. 13), is to Seattle’s predominantly 20-something local underground as wily 42-year-old pitcher Bartolo Colon is to the New York Mets pitching staff. Ramm, singer-guitarist Rachel Ratner and bassist Matt Nyce are roughly Colon’s age and between them, they’ve probably played in as many bands as Colon has teams. With tag-team boy-girl vocals in the spirit of the B-52’s or local heroes the Fastbacks, its dozen taut, scrappy songs have a distinctly Seattle bent. That includes stories of gross punk houses (“Dump”) and all-night parties (“Capitol Hill”) that mix youthful, laugh-out-loud humor with grown-up insight. “They’re one of my favorite bands, a Seattle supergroup,” says Funhouse booker Brian Foss. The new venue is more snug than the old one but Foss now has the option of hosting all-ages shows, which he didn’t before. It maintains the “make yourself at home” basement atmosphere of the old place. For Wimps to have the record-release show there was a no-brainer. When the old Funhouse shuttered in 2012, some feared Seattle’s punk scene might die with it. But with three newer bands opening the show (Mombutt, Boyfriends and Stickers) and a burgeoning punk-rock hub taking shape on Eastlake Avenue — Lo-Fi, Black Lodge and Victory Lounge are four blocks north — the scene is feeling very much alive, with Wimps as respected veterans. And their season is just getting started. In addition to the record release, the band has another Funhouse show Dec. 11 for Foss’ birthday, and plans to tour “Suitcase” nationally — and possibly abroad — in 2016. Like Colon, they’ve found the fountain of youth simply by trusting their stuff.